I have no topic for today D: But I’ll take this opportunity to share my latest gaming find (to be honest... I didn’t find this game, but a good friend of mine did). 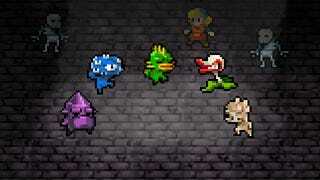 Roguelikes... it seems like they’re the new platformer of the 90s or the shooter of the 2000s. Every small studio wants to dip their hands into the genre and every one of them wants to add their own spice to the formula. Unfortunately, few of them manage to achieve that. I’ve played many roguelikes in the past few years and very few have managed to hook me like Crypt of the NecroDancer. What’s worse being second or being the first loser? If you could take one song to a deserted island... which one would it be? Oh yeah I’m also covering for Twizm whose PC died late last night.